The first half of the two-part finale of the 15th and (probably) final season of American Idol airs Wednesday night, and with it goes an important chapter in American cultural history. While the U.K. had enjoyed Idol-type shows for years, before the competition premiered in 2002, Americans, long comfortable with the idea of overnight fame, had never quite seen it broadcast to them so readily. Perhaps more importantly, they had never before been able to involve themselves in the process. But there’s more to Idol than the experience of watching it—there’s the thousands of people who have auditioned to be on it, and the far fewer who have actually made it far enough in the competition so that we remember them. Unlike The Voice, which is a ratings juggernaut but has done more for the fame of its famous mentors than its participants, or The X Factor, which barely lasted here, Idol actually made stars we still talk about, like Kelly Clarkson and Carrie Underwood. Despite the fact that the judges’ table has gone through several iterations and looks very different than when the show began, and the fact that it’s been canceled because of falling ratings, Idol is still a huge deal to many people, and many of those who have made it into this final season have expressed excitement that they grabbed one last chance to be a part of history. 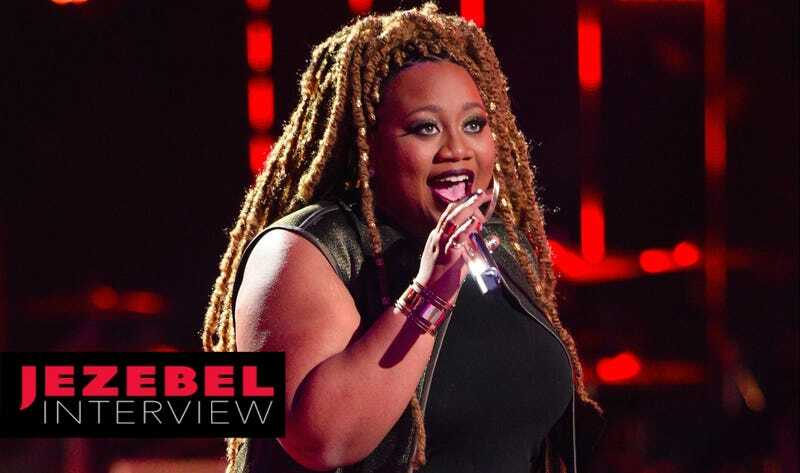 Though the past few seasons haven’t seen an Idol winner become a big star, for viewing audiences, one impressive face has come out of this season: La’Porsha Renae, a 22-year-old single mother from McComb, Mississippi, who has a voice the judges have barely been able to critique. La’Porsha is one of three Idol finalists, alongside Trent Harmon and Dalton Rapattoni. Despite the fact that the biggest Idol successes are women, and that the judges this season regularly commented on how many women made it through “to Hollywood,” Idol voters have historically not been friendly to women, preferring young singer/songwriter-type white men, often from the South. On Tuesday, I spoke to La’Porsha about the experience of being consistently praised by the judges, being the last woman left on Idol, and what we can expect from her finale performances (even she doesn’t know). Our conversation has been lightly edited for clarity. Congratulations on making it so far. You first auditioned for American Idol when you were 16, during Season 8, but didn’t make it to Hollywood. What did you do differently this time? I think life experiences really played into how much motivation and determination I had, because I have my daughter now, so when I get up there it’s about her, which makes me more fearless, and not really care about messing up or trying to be perfect. I just want to convey emotion and the message of the song. It was great seeing you talk last week about how you weren’t really connected to the lyrics of “Stay With Me,” which you didn’t pick to sing. [“She’s begging a man to stay with her, I’m not about to sing that song. So I didn’t like the message—I would never tell a woman to beg. I just had to get in character and sing the doggone song,” La’Porsha said of the song after the fact.] That was such a funny moment to me. It was cool to see you be so honest, and it was also really interesting to see the judges respond to you and say, yeah, we could tell that you weren’t really loving it. [Laughs] Yeah. I mean, I am well-known now but that doesn’t change who I am as a person. I’ve always tried to be an honest person, and I think it’s important for your fans to know you as a real person and know that you have real feeling for you to be relatable. I never want to come off fake or bougie or whatever; if I’m asked a question, I’m going to answer it honestly. When I was watching I thought, yeah, I don’t know if I love this song for her, but I couldn’t quite figure out what it was. Yeah, it just didn’t go with my personality. I had been singing inspirational songs and songs that make you laugh or feel good the whole season, and that’s what I stood for, and then to turn around and sing a begging song like that was just—no, it just wasn’t me. Earlier in the season, it was pretty special to see you paired up with Fantasia, musically-speaking, but also because of the similarities you have in your backgrounds. What was it like working with her? She was amazing. She was so warm-hearted, so sweet, and so inspirational. Of course, unfortunately, we did have similar backgrounds, but she just told me to take that and fuel my singing and fuel myself with that on stage, let that be my motivation to keep going. She also gave me some good advice about not really following social media all that. You know, it’s okay to post but just don’t read into it because there is a lot of negativity and it will bring your spirits down. And if your spirits are down when you perform they’ll be able to tell. She just really gave me some really helpful advice on how to survive this competition. So you’re purposefully not reading too much stuff out there. Yeah no, not too much. I mean I’ll post and I’ll kind of scroll down pictures on Instagram, but that’s about it. I don’t even go on Twitter—I mean I post on Twitter but I don’t read anything. On Facebook I just watch my performances back. Is it weird to watch yourself? Not really, because I’m critiquing. Every time I’m watching I’m like, dang, I should have did this, I should have did that, and I try to make my own critiques since I’m not getting any from the judges [laughs] and kind of critique myself and compete with my last performance. What kind of criticisms are you giving yourself? I actually saw that, and thought, I think she forgot the words but she did a really good job. Which is all that matters, right? You don’t want to stop the flow. That’s all people care about. Yeah, that’s true. I mean I had to keep going. But I don’t know why I forgot the words on that part, that was the chorus; I knew that part. I was worried about forgetting the words on the verse! I don’t know. But I forgot the words. And then I went for a note at the end of the song and it didn’t happen, so I had to make up for it like with a kind of growling run or something at the end. So it was really rough. And Keith said he loved it and I got all good reviews from the judges. Do you feel like Idol fast-tracks how quickly you learn things? It seems like you must jam so much information in a really short period of time. Actually, I’m used to learning things so fast, especially if I like something—if I like something, I can learn it in a day. But the fast-track part is eliminations and how fast the competition is, it’s almost over. That’s the fast-track part. And then having to learn choreography is not something I’m used to. There’s also this whole crew of people that you also must have gotten pretty close to that we the viewing audience don’t really have any connection to. Yeah. The band is great, and they’re really talented, really special. We are close. Rickey [Minor, American Idol’s bandleader] comes up to us all the time giving advice, telling us to stick to our guns and always do what we’re comfortable doing on stage and if there’s something in the arrangement we don’t like, let him know. He’s pretty workable, everybody there is. Only five women have won the show, as opposed to nine men. Is that a thing you think about? It is. I did notice because I watch the show and it makes me almost mad. So I’m using that to fuel me and the perfect bookend to Kelly would definitely be a woman winning. A woman started, a woman should finish. I’m not going to be able to even the number out, but we need some more women. Early on this season, a lot of women made it through, but then it seemed like once it got to the voting rounds they started to drop away. It’s a weird set up. Yeah, I don’t know how that happens either, but it happens. I was very determined to stay in there. I guess I did something that works and I’m grateful for that. I’m grateful to my fans, they’re really loyal and hopefully they can get me on in the finale. Obviously you’re in it to win it, but do you kind of feel like, regardless of what happens you’re going to be able to do what you want to do moving forward. All three of us, like you said, we want to win. But it’s not devastating not to win, as it would have been probably devastating to go home earlier than this. Now that we’re top three we’ll always be remembered as top three of the final season. It is a thing where if we left we would definitely leave with grace and hope and leave inspired to just keep going and use the momentum of the show to build our careers and jumpstart them. It seems like once you make it this far, you’ve met so many people that there’s a pretty good chance you could get a record deal or a tour. You’ve made these connections, which is I guess part of the reason why people go on Idol in the first place. Yeah, it’s more about the connections and the exposure and it’s about using Idol as a platform. So every week you go out there, you’re not really singing for the judges, you’re singing to sell yourself to America and kind of audition for different record labels. Was Idol always the way you thought would be best to launch your career? What did you think about other similar shows? I watched Idol from the start, so it kind of just was embedded there, so even when The Voice came out it was still about Idol. Maybe it’s because I was introduced to Idol first. Can you give me a sneak preview of this week? Unfortunately I can’t because I don’t know; we’re still figuring out a whole bunch of stuff. It’s crazy—whatever you end up seeing is going to be magic, literally, because we have no idea what we’re doing. We’re all over the place with it. But it’s gonna be good. You know it’s gonna be good, you just don’t know why or how. They tell us the bare minimum. Y’all probably know more than we do. When you think about where you want your career to go, what do you think about? What’s your next move? I’m visualizing maybe, like, a mini cover tour of the songs that I did on the show or something, I don’t know yet. I really don’t know, but I have been thinking about different avenues and ways to jumpstart things. Do you want to write your own songs? I do write my own songs. I have a whole songbook. Yeah, that’s part of it. It’s great to see you guys do covers, but it’s after the fact that you really get to see what kind of artist people want to be. Yeah. It’s imperative that we pick songs that kind of represent what kind of artist we want to be because that goes into selling yourself, and you don’t want to sell yourself to the wrong people. Then they have a different look or a different perception of you then what you want to actually be as an artist. So that’s what we try to do; we try to market ourselves the best way we know how to match the actual artist. Well, we love watching you do your thing, so good luck. I’m excited for you. Thank you. Are you voting? I don’t know if I’m journalistically allowed to vote? I’ll ask my editors. Yeah you’re allowed. Tell your site to vote for me!